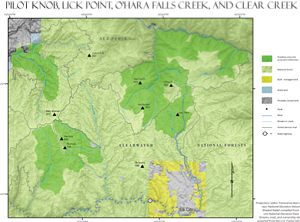 Lick Point Roadless Area is 7,000 acres and separated from O’Hara – Falls Creek Roadless Area by only one road, and situated west of the expansive Meadow Creek Roadless Area. The entire area sits at a relatively high elevation between 5,000 – 6,000 feet, and contains the crucial headwaters of the American River in the far southeast corner, as well as Lick Creek. Meadows spread along the creek bottoms; the remaining land is rolling hills of similar topography. They cover mostly brush fields punctuated with shady alder glades and stands of old-growth lodgepole pine. Payson’s milkvetch and Evergreen kittentail, both rare and sensitive, can be found among the meadows and canopy. The American River is an integral habitat for anadromous fish, the transparent waters creating a haven for steelhead trout, Chinook summer salmon, rainbow, cutthroat, and whitefish. The region is rich for moose forage, elk summer range, and wolf habitat. Unfortunately cattle have left noticeable impacts on the landscape, on the trails and at streambeds. In conjunction with neighboring O’Hara – Falls Creek and Meadow Creek Roadless Areas, the region contains crucial anadromous fish habitat in the Nez Perce – Clearwater National Forests, and needs further protection to alleviate current pressures and intrusions on this important ecosystem.